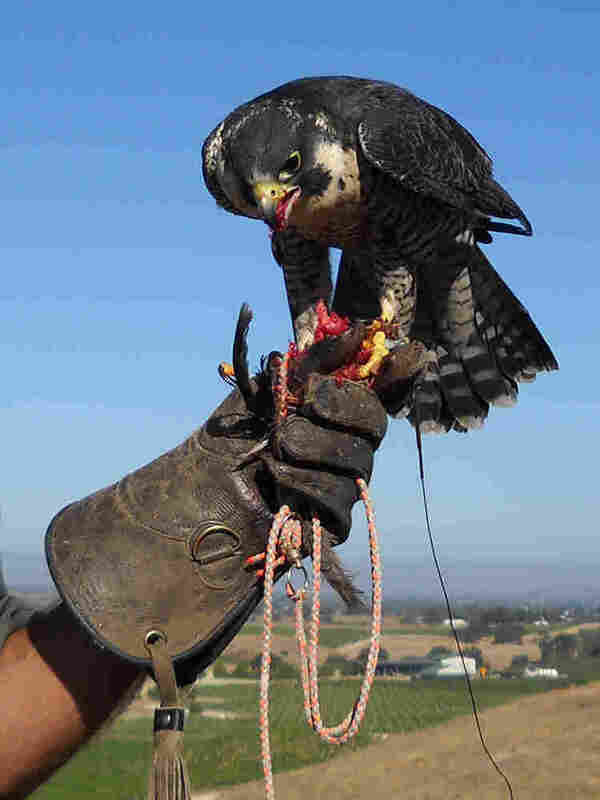 Beware The Attack Bird: Vineyards Turn To Falcons It's harvest time for California's winemakers, and no one knows that better than starlings. The grape-loving birds can eat their way through a vineyard pretty quickly. Over the years, winegrowers have tried a number of methods to scare the birds away — and some are now turning to an ancient art: falconry. Fonzie, one of Tom Savory's falcons. It's harvest time for California's winemakers, and no one knows that better than starlings. The grape-loving birds can eat their way through a vineyard pretty quickly. Over the years, wine growers have tried a number of methods to scare the birds away, and some are now turning to an ancient art: falconry. On one early morning in the Camatta Hills Vineyard, falconer Tom Savory and his crew are on the job. "The birds, the dog and myself — we are a team," he says. Their small camper truck rolls slowly over the dusty dirt road. Sadie, his dog, sits up front. And behind them, sitting calmly on their own perches, are five falcons. It's the falcons' job to scare off the starlings in this vineyard, where Savory stops his truck. Only one bird will fly at a time, and this is Fonzie's turn. The peregrine falcon will patrol these 640 acres in a very short time. The bird knows he'll be in the air soon. His talons grab the falconer's worn leather glove. He adjusts his wings and his brown eyes, glistening gold in the sunlight, scan the surroundings. "All right, just give him a chance to get his bearings a little bit." Savory waits while the bird adjusts. Then Fonzie launches into the air. He circles, then lifts upward. Falcons can spot starlings from a half-mile away. Savory has clocked the birds at 150 miles an hour, and when starlings see the bird of prey in the sky, they leave fast. Savory's falcons have been on the job here a few days now, and the larger flocks of starlings have disappeared. Wine grower Hillary Graves says that's a testament to the effectiveness of the falcons. "Here is a bird that's basically doing what it would do in nature anyways — but for our benefit," she says. To scare away starlings, winegrowers have tried everything from shotguns and loud noises to covering the individual rows of grapes with netting. Graves found netting too costly, so before hiring a falconer, she tried propane cannons. The neighbors didn't like that at all. And the smart, grape-loving starlings learned fast. "They'd hear the sound, fly away, and when the gun went off, they came right back," she says. Cost and sustainability are what's driving some prominent vineyards to use falconers for bird abatement — including E.&J. Gallo, one of the largest wine producers in the state. But falconry is not an easy job. It takes five years to become a master falconer, including a two-year apprenticeship. "As much as some people try, a lot of people don't make it," Savory says. "You have to be born with it." Savory's falcon is now a dot in the sky, along with a red-tailed hawk. Before a territory skirmish can begin, Savory calls Fonzie in by swinging a lure — a tennis ball with pigeon feathers — over his head. The falcon is now out of sight, but Fonzie can still see and hear Savory — and knows his whistle. "They are generally a one-person animal," Savory remarks. With a whoosh, Fonzie swoops in and alights on Savory's shoulder. He feeds the falcon raw quail meat by hand. During his 40 years as a falconer, Savory has developed a special relationship with the birds. "Flying the falcons, I feel I am the observer of something that is very grand," he says. The sun is now directly overhead. Savory will return in the late afternoon to fly his birds again. And so it goes, every day — until the final harvest.